At first glance, robins and orioles might be mistaken for one another because of their orange breasts. They aren't likely to stand still long enough for observers to see that they are, in fact, different birds. Still, the many differences between the two are easy to spot when they're in flight, hunting for food or singing their distinctive songs. All it takes is some knowledge of what to look for, and where. Robins are larger than orioles overall, with an average length of 10 inches. Members of the thrush family, robins have typical thrush bodies -- rounded and stout. They've even been described as potbellied. Orioles are more slender than robins, but smaller -- ranging from 6 to 8 inches long, depending on their species -- like the blackbird family to which they belong. While both birds sport the distinctive orange breasts, the variations in color can be remarkable. Baltimore orioles tend to have a flame-orange breast, while Bullock's orioles breasts are not as bright. Robins' chests vary from maroon-red -- hence the term "robin redbreast" -- to peach, which can convince some viewers they're not really seeing a robin at all. Robins have another color cue, however. They all have a white patch at the bottom of the belly and under the tail, both details that are easily spotted in flight. Orioles have black heads and backs, while robins are more gray. Bullock's orioles have orange cheeks and black crowns. Finally, orioles have silver-black bills, compared with robins' yellow bills, which can be tipped in black depending on the season. The familiar red-breasted birds that hop along the ground, pecking and pulling in search of worms, are robins. They tend to be ground foragers who look for buried worms and insects. 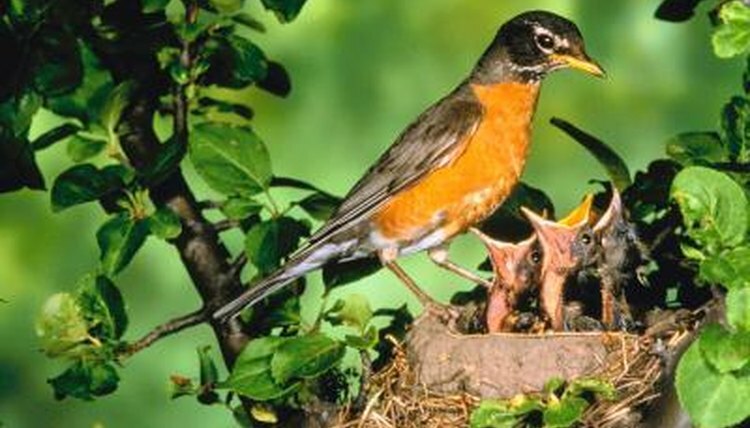 Both robins and orioles nest and sit in deciduous trees, but orioles spend most of their time in the high branches, looking for insects on the leaves. Even their nests hang from the higher branches. Orioles will sometimes come down for ripe fruit on a lower branch or a piece of cut orange hanging in a backyard. Orioles spend summers in the northern and central US, migrating south and west for the winter. Robins can be found throughout the US year-round, though many migrate to southernmost states in the winter, too. From their perch high up in the trees, orioles can be seen flying slowly from one tree to another. They may practice their whistling song as they fly. More often, orioles can be heard high up in the trees, chattering their "here, here, here" sound, even if they can't be seen. Robins fly with fast wing beats and short glides with wings closed. Their sweet, melodic "tweet, chirp, chirp, chirp" is one of the earliest morning bird calls.